The FRACTAL research programme is working alongside local government authorities in several southern African cities, to help design climate-responsive development plans. ‘Embedding’ a researcher into each city administration is key to an inclusive process. This is the story of embedded researcher Kornelia Iipinge in Windhoek. When the Namibian capital nearly ran out of water at the height of the three-year drought that struck the region between 2015 and 2018, Kornelia Iipinge was wrapping up a Masters degree in water resource management. What she didn’t know at the time was that she was about to become a human bridge between climate change researchers in the capital of her home country, and city managers and politicians who have to design policies in order to make Windhoek more resilient in the face of greater climate uncertainty. 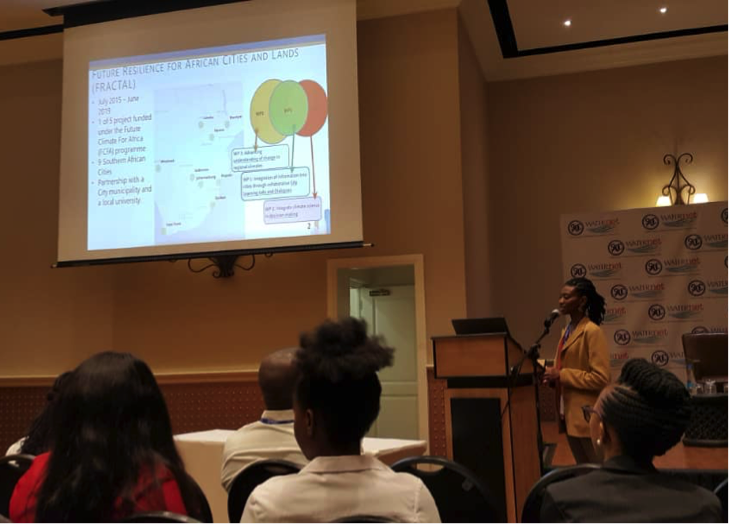 Kornelia Iipinge presenting The Story of Water in Windhoek: A Narrative Approach to Interpreting a Transdisciplinary Process paper at the 19th WaterNet/WARFSA/GWP-SA Symposium, Livingstone, Zambia. What she’s since learned, the 28-year-old year old Iipinge says, is that if a city like Windhoek wants to gear itself up for similar extreme droughts in future, it’s not enough for city managers just to have technical knowledge about how climate change will hit the region with greater droughts or heat waves. Becoming resilient in the face of greater climate uncertainty is also about building human relationships, having face-to-face interactions between people, and establishing networks outside of one’s own areas of responsibility within the city. Iipinge was recruited for the FRACTAL project, run in nine cities across southern Africa, which aims to develop new climate knowledge and new ways to build capacity within and between cities to respond to climate change. The initiative also hoped to bridge the often lamented gap that exists between on-the-ground policy needs of a city, and the ivory-tower thinking of academia and climate research. To this end, FRACTAL adopted the model of the ‘embedded researcher’: someone who had a climate-related or urban research background and ideally some experience working with government, who could be redeployed into the city administration, and liaise closely with the academic community at the partner universities. This person had to have good technical knowledge of climate change, but also be a strong communicator, and be confident in interacting with people and facilitating group processes. Kornelia Iipinge became Windhoek’s person on the ground, liaising between the City of Windhoek and the University of Namibia. Central to Iipinge’s four-year role is organising a ‘learning lab’ process, which brings together stakeholders from within the city, national government, civil society and development organisations through a series of interactions with climate researchers in order to explore and consider the ‘burning issues’ relating to climate change for Windhoek. She has been instrumental in setting up these learning lab workshops, facilitating the process as it unfolds, and feeding the outputs of the workshops back to the various stakeholders who are part of it. One of the most difficult things, she says on reflection as the position comes to an end in June 2019, was to get people from various disciplines to work together when they have different ideas, or objectives, or processes for getting there. She had to make sure everyone got a chance to be heard, and all ideas get fair consideration, she says. This was more about facing the challenges of managing the human relationships, than about the exchange of ideas themselves. The city personnel had one way of doing things, and the university researchers had another. Iipinge has had to broker common ground for them to work together on, and has found herself working in a ‘third space’ between these two parties, and outside her own comfort zone. *The FCFA work covered in this story is part of the Future Resilience for African Cities and Lands (FRACTAL) research group. It aims to advance scientific knowledge about regional climate responses to human activities and work with decision-makers to integrate this knowledge into climate-sensitive decisions at city-regional scale. This article was written by Leonie Joubert and is part of a series that delves into the science that has been produced by various FCFA projects, and introduces some of the people behind it.